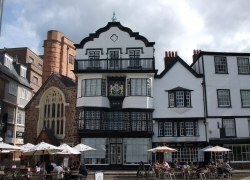 An Exeter shopping area with a history of more than a thousand years! What a great place if the sun is out - You can quietly sit, watch, and soak up the lovely atmosphere that the Cathedral Close has to offer. Alternatively, why not do a little shopping! A lot of the period buildings within the historic Close, Yard and Martin's Lane are occupied by restaurants, bars and numerous shops that sell town & country fashions, shoes, jewellery, paintings, and books. St Peter's Cathedral and its two magnificent Norman towers dominate the Close. The Cathedral is one of Exeter's most popular attractions - With shoppers and visitors all enjoying its presence whilst browsing around. 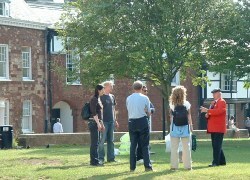 The period buildings on the Close and Yard are included in the Red Coat Guides' Cathedral Close & Palace Garden tour that's featured within our Things to Do in Exeter page. The Cathedral Close is located just off the high street and can also be easily reached from most areas including the Princesshay and the Guildhall shopping centres. Ridgways Shoes, Castle Fine Art, Michael Spiers, Gemstar, and The Edinburgh Woollen Mill. 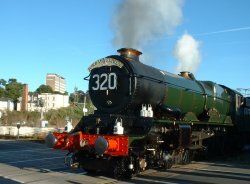 There are several restaurants and bistros within the the Cathedral Close & Yard including: Côte, Tea on the Green, and Pizza Express.